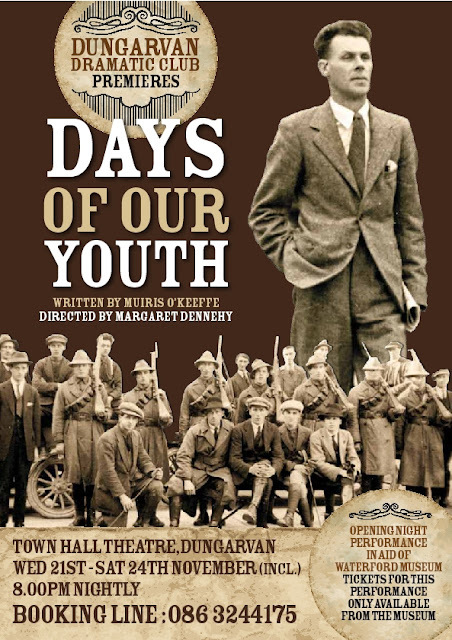 Dungarvan Dramatic Club premieres "Days of Our Youth" by Muiris O'Keeffe and directed by Margaret Dennehy at Dungarvan Town Hall Theatre from Wed 21st to Sat 24th Nov at 8pm each night. Tickets for sale in Museum at €12. Opening night performance proceeds in aid of Waterford County Museum. To coincide with the play Waterford County Museum will host a series of afternoon lectures at the Museum on Sat 24th beginning at 3pm. Ivan Lennon, the son of George Lennon, flies in from the United States to be present for the play. He will also oblige with a short talk about his father on Saturday afternoon. This will be followed by a lecture from Dr Patrick McCarthy. There will be an entry fee of €5 for the afternoon programme, tea and coffee will be provided. Waterford County Museum will also mount a photographic exhibition featuring some of the personalities that feature in 'Days Of Our Youth' in the Town Hall Theatre for the duration of the play.